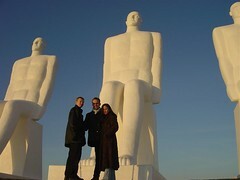 The sun setting on four tall sculptures situated in Esbjerg, all of them identical and staring at the sea. Created by Danish expressionist artist Svend Wiig Hansen. I wonder what the giants are waiting for? The revelation of some truth or the end of the world? Maybe it is the same story as for the vanished civilization on Easter Island. 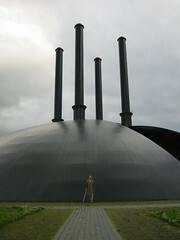 It bears some resemblance to the giant sculpture Elia by Ingvar Cronhammer. Scale, geometry, futurism. One can't help thinking of Mussolini's EUR district in Rome with it's huge entrances, suitable for giants staring at the sea. Elia is also placed next to a medium-sized danish city with ambition, Herning. These days I am reading a novel by Thomas Pynchon and happened to stumble across Fascist Architecture in Thomas Pynchon. These sites might be the perfect place to improve the reading experience and eat a sandwich.